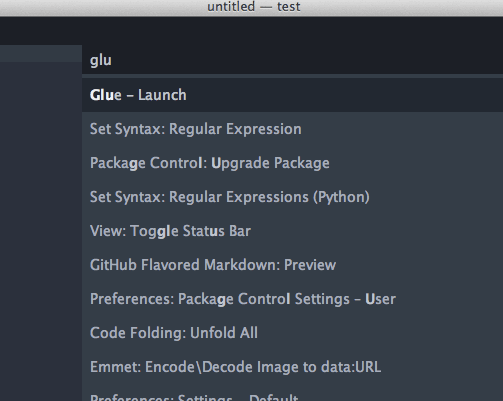 Glue is a cross-platform, extensible plug-in for Sublime Text 2 and 3 that connects your favorite editor to your shell. and the standard output is displayed in an editor view. Glue includes its own version of the cd command that allows you to navigate around your directory structure while maintaining your current working directory state between calls to the shell. See the Navigation documentation for details. You have the option to pass additional command line arguments, clipboard data, or the current working directory path to the mapped system command with template tags. 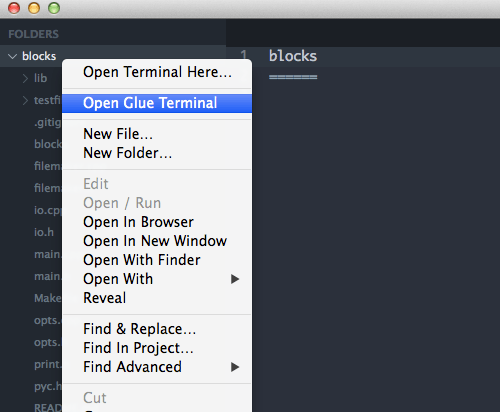 Create a directory in your Sublime Text Packages directory (Preferences > Browse Packages) that is named Glue-Commands. 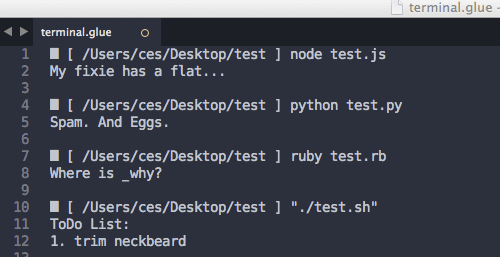 Create a new file in this directory with the following path Glue-Commands/glue.json. Use the glue.json file to create Glue extensions with key = command name to value = command string mapping. in your current working directory and is accessible in any Sublime Text project. More detailed extension documentation (including additional examples) is available here. ✱ Glue is a non-interactive interface to your system shell. See the limitations that result from this application structure. © Copyright 2014, Christopher Simpkins.